What causes high HC. What causes high Hydrocarbon - SmogTips.com. Failed HC Emissions. Why did my car fail the emission test for high HC emissions. What is HC. My vehicle failed the emission test for high Hydrocarbons. Why my car produced high HC. High HC failures explained. How can I lower HC. Common high HC failures. Common HC faults. Failed high HC. Failed high Hydrocarbon. What Causes High Hydrocarbon (HC)? Below are common failures which are likely to produce high Hydrocarbon HC. Hydrocarbons are basically raw fuel, otherwise known as Gasoline. High Hydrocarbon (HC) emissions are almost always a sign of poor fuel ignition. However, it's not always that the engine's ignition system is responsible for high Hydrocarbon emissions. Read on. 1. Improper Ignition Timing - Engine ignition timing is measured in degrees before or after Top Dead Center (TDC). Example of an ignition timing failure would be in the case where an engine's ignition timing is required to be set at 10 degrees Before Top Dead Center (BTDC) and instead is set to 15 degrees BTDC. This fault will not only cause a smog check "functional failure", but will increase Hyrdocarbon (HC) emissions as well. California allows 3 degrees +/- off of the manufacturer's required setting. Note: Late model vehicle's may not have a distributor, and therefore no timing adjustment will be needed. On these engines timing is electronically controlled by the ECU (Engine Control Unit). 2. Defective Ignition Components Your vehicle's ignition system consists of the ignition coil/s, distributor*, distributor cap*, distributor rotor*, ignition wires, and spark plugs. If any of these components are defective the engine will produce high hydrocarbons. A common reason ignition components perform poorly is due to carbon build-up. High ignition voltage traveling through the air pockets within these components form carbon. Carbon acts as an insulator between paths of electricity, decreasing the energy required at the spark plug to ignite the air/fuel in the combustion chambers properly. *Distributor-less engines do not have these components. 3. Lean Fuel Mixture - Any condition which will cause unmetered air to enter the intake manifold, and ultimately the combustion chambers, will cause high hydrocarbons (HC). This condition is called a lean miss-fire. Such faults as vacuum leaks and gasket leaks will cause lean fuel/air mixtures. Broken, disconnected or misrouted vacuum hoses will do the same. It is also important to note that many engine components rely on engine vacuum for proper operation. 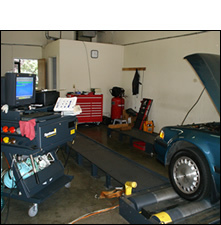 If any of these components are defective, externally or internally, they may cause large vacuum leaks as well. A good example of such a component is your vehicle's power brake booster. 4. Defective Catalytic Converter - A defective catalytic converter (CAT) may be responsible for high HC, CO, and NOx emissions. The Catalytic Converter, commonly referred to as the CAT is a component designed to continue the combustion process within itself and emit a more thoroughly burned and less harmful emissions containing exhaust. The most accurate way to find out if your vehicle's CAT is working efficiently is by using an exhaust gas analyzer. Unfortunately this tool is fairly expensive. Testing the CAT should be conducted at a smog check repair station. a. Major loss of power over 15-25 mph. This may be an indication that the catalytic converter is plugged up and restricting exhaust flow. b. Strong sulfer or rotten egg smell emitting from the exhaust on an otherwise good running vehicle. This may be an indication that the Catalytic Converter isn't burning fuel completely, instead storing it, then releasing it as hydrogen sulfide. c. Loud rattle being heard from inside the CAT. This may indicate a broken Catalytic Converter substrate. You may want to ensure this sound is not due to loose exhaust components, i.e. broken muffler flanges, loose exhaust pipes, loose or cracked exhaust manifold. 5. Defective Air Injection Components - Faulty smog pump and related emissions system components will cause high HC. The air injection system is designed to introduce additional oxygen, after the metering system, to the engine exhaust as it exits the exhaust manifold, or directly before it enters the Catalytic Converter; thus burning whatever remaining fuel (HC) in the exhaust completely. 6. Low Cylinder Compression - This fault is one of the less common high HC causing problems we encounter. Reasons an engine may have low or no compression in one or more of its cylinders may include things such as burned intake or exhaust valve/s, defective valve guides and/or seals, defective piston rings, and burned head gasket/s. A wet/dry cylinder compression test will diagnose this fault. More then often if such a problem exists it will be very apparent. You should notice rough idle.